Anyone wishing to submit parish information or records please contact one of us by using the [CONTACT] button at the bottom of the page.. The first place of worship in the Mission of the Bay of Islands was a log house at Birchy Cove. This building was used until the Church, which was dedicated to St. Mary the Virgin, was complete enough for that purpose. Bishop Kelly consecrated St. Mary's on July 30 1871. In 1881 the Mission of the Bay of Islands was divided into the Mission of the Bay of Islands and the Mission of Bonne Bay. The Rev. U.Z. Rule was the first resident Clergyman of the northwest coast with his headquarters at Birchy Cove (now Curling) The Mission at that time extended from the Bay of Islands as far north as Daniel's Harbour. The area was vast, and included such places as Birchy Cove, John's Beach, Meadows, Lark Harbour, Cox's Cove, Trout River, Woody Point, Birchy Head, Rocky Harbour, Cow Head and Daniel's Harbour. St. Mary's Church was enlarged during the incumbency of the Rev. JJ Curling. (Birchy Cove was later renamed Curling after Rev JJ Curling.) Bishop Jones consecrated the extension in the summer of 1886. Its construction was that of True Gothic architecture. The choir stalls and pulpit were made of oak, while the interior was white pine. There were twenty-one stained glass windows to add to its beauty. Fire destroyed St. Mary's Church on February 5 1950. All of its contents were lost to the fire although the parish registers were saved, it is said, by the caretaker of the Church, Mr. Rourke. The rector at that time was Rev. W. Wells. 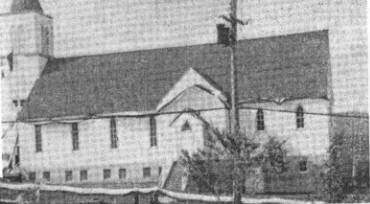 A new Church was built and was dedicated to St. Mary the Virgin on Sept 18 1955 at a more central location. Another division was made to St. Mary's on May 6 1955 at a meeting of the Parish Council. At that time it was decided to form the Parish of \Meadows to take care of all of the Anglican parishioners on the North side of the Bay of Islands. The first rector for the Parish was Rev. F. Hollands. In its centenary year ( 1965) the Parish of the Bay of Islands consisted of the Congregations of St. Mary's, Curling, St. Ambrose, John's Beach, and St. James at Lark Harbour. In 1983 Curling became a separate Parish and the Parish of the Bay of Islands included the people from Halfway Point to Lark Harbour.